Buckhoff has another 699 TOEFL lessons just like this at his Online TOEFL Course: “The 7-Step System to Pass the TOEFL iBT. In fact, Buckhoff’s Online TOEFL Course allows you to have a lot of speaking and writing practice: 20 integrated and 300 independent speaking topics that you can practice and 40 independent and 40 integrated writing tasks that you can complete, with audio and written feedback provided by TOEFL speaking and writing specialists. To make the most of your TOEFL Speaking and Writing Practice, learn the most important points in this lesson. Consistency, according to Merriam-Webster dictionary, is something “marked by harmony, regularity, or steady continuity : free from variation or contradiction.” For example, a waste management company consistently picks up trash in my neighborhood every Tuesday at 6:30 am. Therefore, since we can expect the garbage truck to come every Tuesday, my neighbors and I pull our trash bins to the street the night before pickup. If the garage truck came at unpredictable days and times, we would not be able to anticipate when the waste management personnel would come to pick up our trash. Garbage pick-up companies are consistent, your cell phone clock is consistent, and you should show the same type of consistency in your speaking and writing tasks during your TOEFL writing and speaking practice as your prepare for the exam. 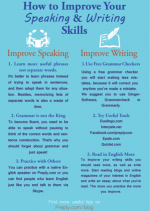 In fact, as your practice the TOEFL speaking and writing tasks, if you are consistent in person and number, verb tenses, verb tenses in mood and voice, and in indirect and directly quoted speech questions, you will show that you have good control over your grammar when completing independent and integrated speaking and writing practice tests. Use a consistent point of view in person and number. In TOEFL writing and speaking practice and exam situations, we use the first person (I or we), the second person (you), and the third person (he/she/it, one or they). I or we point of view >>>Emphasizes the writer/speaker and typically should be used during the TOEFL independent speaking and writing tasks. You point of view>>>Emphasizing the reader, this perspective works well for giving advice or for giving instructions on how to do something. You should NOT use this point of view during the TOEFL independent and integrated speaking or writing tasks since there is no need to talk directly to your audience. He/she/it, one or they point of view>>>Emphasizing the subject, this perspective works well in professional and academic forms of writing. In fact, use this point of view during the TOEFL independent and integrated speaking and writing tasks. Students unfamiliar with the TOEFL speaking and writing tasks or those who do not have enough TOEFL writing and speaking practice may have difficulty deciding on a point of view, so they will shift randomly from one point of view to another. To show better control of your language use, you should choose a suitable perspective based on the speaking or writing response and stay with that point of view. For example, let’s take a look at the six speaking and two writing task prompts to decide on which point of view will work better. Of course, as you complete your TOEFL speaking and writing practice, you should consistently use these points of view. TOEFL Independent Speaking Task 1: If someone came to visit your hometown, what activities would you suggest they do? Give reasons and examples to explain why. Since this question is asking you to suggest activities that someone would enjoy and since this question is asking you to rely on your personal experience to answer this question, the first and third person points of view work well. Inconsistent point of view: If someone came to my hometown, I would suggest that they visit Newport beach. You will see more than 5 kilometers of white sand and blue ocean. We could swim, surf, boogie board, and just lay in the sand soaking up the rays. In addition, going to the beach is also a fun activity since you will be able to visit the many coastal shops offering a variety items such as clothes, sunglasses, swimming and surfing gear, and souvenirs. Consistent point of view: If someone came to my hometown, I would suggest that s/he visit Newport beach. This person will see more than 5 kilometers of white sand and blue ocean. He/she could swim, surf, boogie board, and just lay in the sand soaking up the rays. In addition, going to the beach is also a fun activity since this visitor will be able to visit the many coastal shops offering a variety items such as clothes, sunglasses, swimming and surfing gear, and souvenirs. Since the second response primarily uses the third-person point of view, the paragraph has a more consistent, unifying theme. TOEFL Independent Speaking Task 2: Do you prefer bicycling or swimming as a regular form of exercise? Why? Use reasons and details to explain your preference. Observe how the first response, using the first-person point of view, has a more consistent, appropriate point of view than that in the second response. Consistent point of view: I definitely prefer bicycling because my city has only about 3-4 months of warm swimming weather. Therefore, since we do not get too much snow, I can still bicycle during the year when it is too cold to swim. Furthermore, I do not have a swimming pool at my house, so it is inconvenient for me to go somewhere to swim. The ocean is more than 5 hours from my house, and there are no lakes nearby for me to swim in. As a result, bicycling is a much more convenient option. Inconsistent point of view: Bicycling is preferred by many because my city has only about 3-4 months of warm swimming weather. Therefore, since there is not too much snow, many bicycle during the year when it is too cold to swim. Furthermore, most residents do not have swimming pools, so it is inconvenient to go somewhere to swim. The ocean is more than 5 hours from our city house, and there are no lakes nearby to swim in. As a result, bicycling is a much more convenient option. In contrast, the speaker uses the third-person point of view primarily, and it distances the speaker further and further from the purpose of the speaking task. In fact, it is unclear if any of these ideas relate to the speaker’s personal opinion. During the TOEFL speaking practice, try to avoid this type of inappropriate point of view shift. TOEFL Integrated Speaking Task 3 (Reading, Listening, Speaking–Campus-related): The man expresses his opinion about the university announcement. State his opinion and explain why the man holds this opinion. In the first response, the speaker appropriately and consistently uses the third person point of view (.i.e., “reading passage,” “the listening passage,” and “the man”) to explain the most important points from the reading and the listening passage. Using the third point of view clearly marks this response as a summary (with an objective tone!) and helps to use clear voice markers to explain which information is coming from the reading or listening passage. This is how you should frame your responses as you have TOEFL speaking and writing practice. Consistent point of view: According to the reading passage, the university wants to condense final exams into three straight days. However, in the listening passage, the man objects to the new policy. First of all, the man believes that students need more than just three days to complete final exams and that this new condensed final exam schedule would force students to study all night long in order to prepare. Second of all, the man also dislikes this new policy because some students take classes which also have lab final exams such as physics, biology, and chemistry. Therefore, it would be unfair, according to the man, to require these science students to complete all their final exams and lab final exams in just three days. On the other hand, observe how in the second response the speaker does not acknowledge the reading or the listening passage. Even though the speaker uses the third person point of view (i.e., “students”), it is unclear who is saying what. As a result, TOEFL iBT human raters will have to assume that the speaker is giving his personal opinion on the topic. In addition, this speaking task is asking the speaker to summarize the ideas, which means the speaker will receive a lower score for not effectively addressing the speaking task. Inappropriate point of view: The university wants to condense final exams into three straight days. However, students need more than just three days to complete final exams and that this new condensed final exam schedule would force students to study all night long in order to prepare. In addition, some students take classes which also have lab final exams such as physics, biology, and chemistry. Therefore, it would be unfair to require these science students to complete all their final exams and lab final exams in just three days. TOEFL Integrated Speaking Task 4 (Reading, Listening, Speaking–Academic): The professor gives some background about the Pearl Harbor that was a precursor to the United States’ entering World War II. In the following response, the speaker appropriately uses the third person point of view (i.e., “reading passage,” “the speaker,” and “the author”) to use an objective tone to combine the most important points of the reading and listening passage. Consistent point of view: The reading passage discusses about an event called Pearl Harbor, and the speaker in the listening passage adds to this information by providing some background information. According to the author, Pearl Harbor was a naval base in Hawaii, and on December 7, 1941, it was attacked by Japanese airplanes, killing 1000’s of US soldiers. Twenty-four hours after the attack, US President Franklin D. Roosevelt asked congress to declare war on Japan. The speaker in the listening passage provides two background details about this incident. First, the speaker claims that US and Japanese relations had been worsening long before 1941 since Japan had declared war on its neighbor China. In fact, according to the speaker, Japan had even invaded China’s territory in order to assert economic control over China’s import market. Second, in response to this aggression, asserts the speaker, the US imposed economic sanctions and embargoes to punish Japan for its aggression against China, and these sanctions and embargoes eventually led Japan to attack the US at Pearl Harbor. Conversely, in the following response, the speaker uses “we,” “I,” “you,” and eventually near the middle of the response exclusively focuses on the third point of view without even acknowledging the speaker in the listening passage. Therefore, the speaker’s point of view is both inconsistent and inappropriate. Make sure in your TOEFL speaking and writing practice that you use voice markers to identify the author and speaker in the passages. Inconsistent and inappropriate point of view: We read in the passage about an event called Pearl Harbor, and you hear the speaker in the listening passage add to this information by providing some background information. I also read that Pearl Harbor was a naval base in Hawaii, and on December 7, 1941, it was attacked by Japanese airplanes, killing 1000’s of US soldiers. Twenty-four hours after the attack, US President Franklin D. Roosevelt asked congress to declare war on Japan. I heard two background details about this incident. First, US and Japanese relations had been worsening long before 1941 since Japan had declared war on its neighbor China. In fact, Japan had even invaded China’s territory in order to assert economic control over China’s import market. Second, in response to this aggression, the US imposed economic sanctions and embargoes to punish Japan for its aggression against China, and these sanctions and embargoes eventually led Japan to attack the US at Pearl Harbor. TOEFL Integrated Speaking Task 5 (Listening, Speaking–Campus-Related): The woman has two suggestions to help the man. Describe the man’s problem and the two suggestions that the woman offers. Then explain which of the two suggestions you like and why. This first response for TOEFL integrated speaking task 5 appropriately focuses on the problem and the two solutions by using the third person point of view (i.e., “the man” and “the woman”), thereby creating a more objective tone for the part of the response. Then, the speaker uses “I” or the first person point of view to change from an objective to a more argumentative tone. As a result, the speaker has effectively addressed all parts of the speaking task from the most appropriate point of view. Consistent point of view: According to the listening passage, the man is having trouble finishing his research paper for his history class because he is unsure how to find scholarly sources. The woman offers him two solutions to help him find research: 1) The man can go directly to the university library’s web site and use trial and error to find the sources he needs. or 2) The man can consult a reference librarian to get advice on how to find the scholarly sources that he needs to finish his writing project. Personally, I prefer the second solution because the man should consult reference librarians, all of whom are experts in critical information literacy. Therefore, once the man shares his research question and thesis, these librarians will be able to recommend which databases will yield the most relevant information for his paper. Lastly, consulting reference librarians will ensure that the man find peer-reviewed journals and articles, which is often a requirement for these types of research projects. However, in this second response, the speaker maintains the third person point of view throughout the response, hence posing two problems: 1) His/her response is not framed as a summary with clear voice markers which acknowledge who is saying what. For example, at what point is the speaker explaining the woman’s solution to the man’s problem? 2) It is not clear when the speaker is articulating his argument. Inconsistent point of view: The man is having trouble finishing his research paper for his history class because he is unsure how to find scholarly sources. The man can go directly to the university library’s web site and use trial and error to find the sources he needs. or 2) the man should consult a reference librarian to get advice on how to find the scholarly sources that he needs to finish his writing project. The man should consult reference librarians, all of whom are experts in critical information literacy. Therefore, once the man shares his research question and thesis, these librarians will be able to recommend which databases will yield the most relevant information for his paper. Lastly, consulting reference librarians will ensure that the man find peer-reviewed journals and articles, which are often requirements for these types of research projects. TOEFL Integrated Speaking Task 6 (Listening, Speaking–Academic): Using examples and details from the lecture, explain the water cycle process here on Earth. In the first response, the speaker uses the third person point of view to refer to the information from the lecture (i.e., “water cycle,” “evaporation,” “condensation,” and “precipitation”) and to also acknowledge the source (i.e., “professor,” “speaker,” “lecturer,” and “it is learned”). Therefore, this response is clearly framed as a summary with a consistent point of view. Consistent point of view: According to the professor, Earth’s water cycle consists of three elements: evaporation, condensation, and precipitation. The first process of the water cycle, the professor describes, is evaporation when the water from lakes, oceans, and rivers rise up and change into a gas called water vapor. Evaporation, the speaker claims, is heavily influenced by the Sun, wind, temperature of air, and the density of the water. The second process the professor explains about the water cycle is condensation, in which a gas, such as water vapor, changes into a liquid. It is learned that condensation can occur high in the air or at ground level to form clouds and fog or mist. Like evaporation, condensation is influenced by the Sun. When the air cools, according to the lecturer, water vapor becomes saturated, and it reaches its dew point. Finally, according to the professor, the water cycle consists of precipitation, any liquid such as rain, snow, and hail, which condensates and falls back to the Earth. Fog and mist, both of which consist of liquid water suspended in the atmosphere, are not considered precipitation since they do not liquify and fall back to the Earth. The below response is framed from the third person point of view; however, there are no voice markers to frame the information as a summary. Therefore, it is unclear who is saying what. Inconsistent point of view: Earth’s water cycle consists of three elements: evaporation, condensation, and precipitation. The first process of the water cycle is evaporation when the water from lakes, oceans, and rivers rise up and change into a gas called water vapor. Evaporation is heavily influenced by the Sun, wind, temperature of air, and the density of the water. The second process about the water cycle is condensation, in which a gas, such as water vapor, changes into a liquid. Condensation can occur high in the air or at ground level to form clouds and fog or mist. Like evaporation, condensation is influenced by the Sun. When the air cools, water vapor becomes saturated, and it reaches its dew point. Finally, the water cycle consists of precipitation, any liquid such as rain, snow, and hail, which condensates and falls back to the Earth. Fog and mist, both of which consist of liquid water suspended in the atmosphere, are not considered precipitation since they do not liquify and fall back to the Earth. TOEFL Integrated Writing Task (Reading, Listening, Writing–Academic): How does the information in the listening passage cast doubt on the points made in the reading passage? Notice how the speaker in the first response embeds voice markers (i.e., the reading passage,” “the author,” “the listening passage,” and “the speaker”) into the paragraph to acknowledge both the reading and the listening passage. In addition, the speaker uses no personal pronouns such as “I,” “we,” and avoids the impersonal pronoun “you,” thereby framing the response as an objective summary combining the information from the reading and the listening passage. Overall, the speaker uses a consistent point of view to integrate the most important ideas of the reading and listening passages. Consistent point of view: First of all, the reading passage claims that employees should read all documents in their entirety. In fact, reading all documents will ensure that employees, asserts the author, are well-trained to conduct their daily job tasks. However, the speaker in the listening passage believes that reading everything in all training materials wastes valuable time that workers need to efficiently complete their job tasks. Therefore, according the speaker, employees should skim through their required reading materials by focusing on the main and most important support points. In this second response, the speaker randomly shifts from the second person point of view (i.e., “you”) to the first person plural point of view (i.e., “we”). In the remainder of the response, the speaker often uses “you” to explain the information from the TOEFL reading and TOEFL listening passage. However, the purpose in the TOEFL integrated writing task is to summarize the information; in other words, since the speaker is not instructing the audience and since the impersonal “you” point of view conveys an informal tone to the audience, the speaker should stick with the third person point of view. Inconsistent point of view: First of all, the reading passage claims that you should read all documents in their entirety. In fact, reading all documents will ensure that we, asserts the author, are well-trained to conduct our daily job tasks. However, the speaker in the listening passage believes that reading everything in all training materials wastes valuable time that you need to efficiently complete your job tasks. Therefore, according the speaker, you should skim through the required reading materials by focusing on the main and most important support points. TOEFL Independent Writing Task: Would you rather have a stable career or an adventurous lifestyle? Give reasons and examples to defend your choice. The first response, using the first person point of view (i.e., “I,” “my,” “myself”), exactly addresses the writing task. Choosing the first person point of view emphasizes the writer, and the writer uses personal experience to explicitly address the writing task. Thus, a personal tone is the most appropriate one for this type of writing task. Consistent point of view: First, I would rather choose a stable career since I will be able to have a more reliable income. For example, my goal right now is to qualify myself to be a certified public account, an non-adventurous job by any measure. However, if I become an accountant for a large, stable company, I will be able to rely on a continuous, lucrative salary, and if I work for that company for several years I will be to get promoted to higher positions. At some point, I may even qualify to become a junior partner and eventually the chief financial officer. Therefore, having a stable career will help me to have a reliable income that will provide more financial stability for me and my family. Unlike the first response, the following response uses distracting shifts from the first person “my,” to the second person “you,” and finally to the third person point of view “some.” These distracting shifts make the paragraph less unified. Inconsistent point of view: First, choosing a stable career is better since it will provide a more reliable income. For example, my goal right now is to qualify myself to be a certified public account, an non-adventurous job by any measure. However, if you become an accountant for a large, stable company, you will be able to rely on a salary, and, if you work for that company for several years, you will be to get promoted to higher positions. At some point, some may even qualify to become a junior partner and eventually the chief financial officer. Therefore, having a stable career will provide a reliable income that will provide more financial stability for families. Be consistent in your verb tenses. Another way to unify the ideas in your TOEFL speaking and writing tasks is to be consistent in the verb tenses that you use. If your response starts with one verb tense and if you randomly shift to another verb tense, TOEFL iBT human raters will think that you do not have good control of your language use, therefore giving you a lower score. When the speaker talks about the present impossible condition of moving to LA, the speaker uses simple past tense verbs (“had,” “would,” “moved”) and when the speaker describes facts about Los Angeles and about his friend, s/he uses present tense verbs (“are,” “have,” “is,” “has,” “sell”). Keeping the verbs consistent helps to unify the ideas in the response, so the iBT human raters will not be distracted or confused. Tips for the integrated speaking and writing tasks: During the TOEFL exam, you will be asked to speak and write about reading and listening passages for the purpose of showing how the main points of the sources relate. In order words, you will be summarizing and integrating the ideas from these passages. In these cases, you can use the present tense, so you do not need to shift back and forth from the past and the present tense. This shifting back and forth with your verb tenses will wreak havoc on your speaking and writing scores. For example, consider the following two responses to an integrated speaking task 4 (reading, listening, speaking–academic): How does the information in the lecture relate to the information in the reading passage? Notice how the speaker uses present tense reporting verbs to introduce the information in the reading and the listening passages. Then, when the speaker retells the story of the auction, the speaker switches to the past tense to recall that event. Therefore, it is easy to understand the time of the actions being completed. Consistent verb tenses: The reading passage defines the economic principle of the law of supply and demand, and the speaker in the listening passage gives an example to illustrate the concept. When the demand of a commodity is high, asserts the author, and when the supply is low, consumers will pay a higher price for a product. To further illustrate this idea, the speaker gives an example of a jar of English Toffee that sold for $285 at a local auction in Southern California. Ordinarily, a jar of Toffee would sell for $15-20, but because there was only one jar being sold at the auction and because ten buyers wanted to buy the tasty treat, a bidding war started among several families, all of whom really wanted to buy the Toffee. The speakers explains that the high demand and that only one jar of Toffee was being sold at the auction caused the price of the treat to soar to almost $300. Therefore, the example the speaker gives about the Toffee shows in a practical way how the economic principle works. However, in the following response, the speaker switches from past to present tense randomly, thus making it difficult to unify the ideas. In addition, randomly switching verb tenses will confound the listener, and, of course, TOEFL iBT human raters will conclude that the speaker has little or no control with verb tenses. Due to language-use issues, the speaker’s score will plummet. Inconsistent verb tenses: The reading passage defined the economic principle of the law of supply and demand, and the speaker in the listening passage gives an example to illustrate the concept. When the demand of a commodity is high, asserted the author, and when the supply is low, consumers would pay a higher price for a product. To further illustrate this idea, the speaker gives an example of a jar of English Toffee that sold for $285 at a local auction in Southern California. Ordinarily, a jar of Toffee will sell for $15-20, but because there was only one jar being sold at the auction and because ten buyers want to buy the tasty treat, a bidding war started among several families, all of whom really want to buy the Toffee. The speakers explains that the high demand and that only one jar of Toffee was being sold at the auction causes the price of the treat to soar to almost $300. Therefore, the example the speaker gave about the Toffee shows in a practical way how the economic principle works. Be consistent with your verbs, especially in mood and voice. Keep the following sentence moods in mind during your TOEFL speaking and writing practice. Unnecessary shifts in mood can be just as distracting and confusing as shifts in verb tenses. There are three moods in English: the indicative, the imperative, and the subjunctive. Indicative mood>>>Used for facts, opinions, and questions. Fact: The reading passages explains about three theories regarding child language acquisition, and the speaker in the listening passage casts doubt on each of the theories. Opinion: Honesty is an important quality because it will foster a feeling of trust in long-term relationships. Question: Which theory, questions the speaker, best explains how children learn a language? Imperative>>>Used for orders and advice. Finish the report as soon as you can. Subjunctive>>>Used to express wishes or conditions contrary to fact. Now that you know the three moods in English, remember that you should not shift unexpectedly from one mood to the other. The author in the reading passage claims that bears who are fed by people are more likely to be aggressive toward humans. Also, do not approach bears even if they seem friendly. The first sentence above uses the indicative mood, but in the second sentence the writer unexpectedly shifts to the imperative mood. Since the writer’s purpose is to explain the assertions being made by the author and not to give orders or advice directly to the audience, the second sentence should also be in the indicative mood: Also, people should not approach bears, argues the author, even if they seem friendly. Also, during your TOEFL speaking and writing tasks, you should avoid any unnecessary shifts with active or passive voice. If you are unclear on what passive or active voice is, Google “using the active and passive voice in English grammar” to get clarification on this most important grammar structure. Unexpected shift from active to passive voice: When the time is right, professors should notify their students about the final exam. Each review handout is given to the students and notes about the key points are taken by the students. Revised: When the time is right, professors should notify their students about the final exam, should give them review handouts, and should encourage them to take notes about the key points. Do not randomly shift from indirect to direct questions or quotations. An indirect question reports what someone has asked without asking it: We asked whether or not we could go on the hike. However, a direct question asks directly: Can we go on the hike? Suddenly shifting from indirect to direct questions is awkward. Moreover, sentences containing both indirect and direct questions are impossible to punctuate in that indirect questions must end with a period and direct questions must end with a question mark. Shift from indirect to direct question: The author in the lecture questions whether or not glaciers can tell us about recent volcanic eruptions and can these gigantic layers of ice help us forecast future weather patterns. Revised: The author in the lecture questions whether or not glaciers can tell us about recent volcanic eruptions and whether or not these gigantic layers of ice can help us forecast future weather patterns. Notice how in the revision both questions are posed indirectly, thereby avoiding the awkward shift. The writer could also ask both questions directly: Can glaciers tell us about recent volcanic eruptions, asks the speaker in the lecture, and can these gigantic layers of ice help us forecast future weather patterns? Furthermore, like shifts from indirect to direct questions, shifting randomly from indirect to direct quotations can also be confusing. Indirect quotations report what someone has said without quoting word for word: The lecturer explains that glaciers are formed high up in the mountains on very steep land. Shift from indirect to direct quote: The professor said that he would be late to class and please work on editing your multi-draft writing project. Revised: The professor said that he would be late to class and that we should work on our multi-draft writing projects. As you can see in the two revised versions, this type of awkward shift can be repaired by either changing both parts of the sentence to indirectly quoted speech or making both parts of the sentence a direct quotation. Eliminating Distracting Shifts Practice Exercises. Using a sheet of paper, rewrite the following paragraphs and sentences to eliminate distracting shifts with point of view in person and number, with verb tenses, with verb tenses in mood and voice, from indirect to direct quotations. Remember that actually writing down these paragraphs and making the necessary corrections will help you to master the concepts so that you have better control of your language use during the speaking and writing sections of the TOEFL iBT. You will see possible answers to these exercises at the bottom of the web page. Point of view: One important quality of a good roommate is you are clean. For example, if you move in with someone who is dirty and does not like to pick up after himself, you will become irritated with this unsanitary behavior. A few years back, I lived with Kent, who was my roommate for about 6 months. He always left his soda cans in the living room after watching television, and quite often, ants, drawn to the sugar in the can, would invade our living spaces creating unsanitary conditions. Once in the house, these ants would venture into our kitchen and get into several types of food in the pantry: cereal, bread, cookies, and potato chips. My roommate’s uncleanliness also cost me a lot of money since I had to throw out a lot of food due to his irresponsible behavior. Verb tenses: Last week, my friend went to the beach to hang out with some friends. When he was there, a very strange event occurred. The kid is digging in the sand to the point that he is creating a complex systems of tunnels until one of the tunnels collapses on top of him. Unfortunately, he is about 1 meter deep in the tunnel when it caves in. Soon many emergency workers started digging to rescue my friend before he suffocated. After a long 34 minute span, emergency personnel pull him out of the deep sand. Verb tenses in mood and voice: Police officials alerted residents in the community about the encroaching wildfire. In addition, alerted these city dwellers that they would need to evacuate within two hours time. Indirect to direct quotations: I wondered whether the woman had advised the man to consult a reference librarian. In addition, did the woman tell the man to attend a 30 minute editing session with a writing center tutor? Point of view: Students preparing for the TOEFL exam should find opportunities to speak English whenever you can. In fact, Toastmasters, an international speaking group, can give you weekly speaking practice with others in your local communities. These aspiring high-scoring testers can learn more about this group by going to http://toastmasters.org. Verb tenses: The author in the reading passage explains about microeconomics, and the speaker in the listening passage gave an example to illustrate the concept. Verb tenses in mood and voice: TOEFL reading passages include many different question types, so testers should become familiar with the testing strategies. In addition, the TOEFL reading passages present the questions in a logical order, thereby making it easy to find the answers. Indirect to direct quotations: The speaker said that the tests would be distributed at the beginning of the class and please use the duration of the class time to complete the arduous test. Point of view: If countries spend more money on meeting the basic needs of their citizens, they will allocate more money toward improving the educational structure. For example, you could benefit since these countries can spend more money on new technology designed to help you learn faster and more comprehensively. In addition, school districts could use the extra money to secure their schools so that there are fewer chances for school violence to occur. Verb tenses: An experience that changed me was my graduation from college, an event which help me to become financially independent. Before I had finished college, I lived at my parents’ house rent free. In addition, they buy me a car, pay for my insurance, and even give me gas money so that I can do my errands. However, when I completed college, I get a job as a pharmacy technician and am able to move out on my own in an apartment not too far from my parents’ house. Having that steady income helps me learn how to budget my money so that I could afford my new living expenses. Had I not graduated, I would not have been able to learn how to live independently. Verb tenses in mood and voice: If Lana has time, she will consult with her TOEFL speaking and writing specialist later on today so she can get some feedback about changes that she should make in her speaking and writing practice routine to help her score higher on the TOEFL exam. Moreover, next week she would register to take the exam if her parents agreed to wire her the money she would need to register for the exam (Revise this to indicate a present possible conditional implied reality). Indirect to direct quotations: “Meta-messages are indirect ways to communicate which foster more involvement in long-term relationships,” argues Tannen, and she also said that involvement is valued more by many women; therefore, they are more likely to use more meta-messages than their male counter parts. Point of view: Unlike coal, solar energy is a viable form of energy that I can use for electricity and heat. First of all, solar power in a clean source of energy that you can use to produce electricity. In areas with abundant sun, you can have solar panels placed on your roof so that these panels can produce sustainable electricity at reasonable costs. Second of all, solar panels can also be used to heat water throughout the year. Therefore, instead of having to rely on electrical companies for power that they produce from burning coal or having to get power from natural gas companies, you can use solar panels to meet your power needs in both of these areas. Verb tenses: If I have to choose between bicycling and running, I prefer running since I can burn more calories quicker and the equipment is less expensive. First of all, running helps me to burn more calories in an hour than bicycling. For example, two weeks ago, I run for one hour, and, according to my GPS watch, I burn 735 calories. However, my friend Frank, who bicycle 60 minutes yesterday only burn 360 calories. I also prefer running since it is not nearly as expensive as bicycling. For example, running shoes, shorts, and a watch will cost $300-$500. However, a bicycle can cost between $300 and $1000’s of dollars. Therefore, I think running is a more beneficial form of exercise. Verb tenses in mood and voice: According the reading passage, advertising affects people’s behaviors politically, and in the listening passage, advertising affects consumers’ economically. Indirect to direct quotations: The reading passage states, “Bears often get on their two hind legs so that they can get a clear vantage point.”, and in the listening passage, the speaker contradicts that information by saying that, when bears are in an attacking position, they will get on all four legs. point of view: One important quality of a good roommate is that he/she is clean. For example, if I move in with someone who is dirty and does not like to pick up after himself, I will become irritated with this unsanitary behavior. A few years back, I lived with Kent, who was my roommate for about 6 months. He always left his soda cans in the living room after watching television, and quite often, ants, drawn to the sugar in the can, would invade our living spaces creating unsanitary conditions. Once in the house, these ants would venture into our kitchen and get into several types of food in the pantry: cereal, bread, cookies, and potato chips. My roommate’s uncleanliness also cost me a lot of money since I had to throw out a lot of food due to his irresponsible behavior. Verb tense: Last week, my friend went to the beach to hang out with some friends. When he was there, a very strange event occurred. The kid was digging in the sand to the point that he was creating a complex systems of tunnels until one of the tunnels collapsed on top of him. Unfortunately, he was about 1 meter deep in the tunnel when it caved in. Soon many emergency workers started digging to rescue my friend before he suffocated. After a long 34 minute span, emergency personnel pulled him out of the deep sand. Verb tenses in mood and voice: Police officials alerted residents in the community about the encroaching wildfire. In addition, law enforcement personnel told these city dwellers that they would need to evacuate within two hours time. Indirect to direct quotations: I wondered whether the woman had advised the man to consult a reference librarian. In addition, I thought about whether she had recommended that he attend a 30 minute editing session with a writing center tutor. Point of view: Students preparing for the TOEFL exam should find opportunities to speak English whenever they can. In fact, Toastmasters, an international speaking group, can give these students weekly speaking practice with others in their local communities. These aspiring high-scoring testers can learn more about this group by going to http://toastmasters.org. Verb tenses: The author in the reading passage explains about microeconomics, and the speaker in the listening passage gives an example to illustrate the concept. Verb tenses in mood and voice: TOEFL reading passages include many different question types, so testers should become familiar with the testing strategies. In addition, questions are presented in a logical order by the reading passages, thereby making it easy to find the answers. Indirect to direct quotations: The speaker said that the tests would be distributed at the beginning of the class and that students should use the duration of the class time to complete the arduous test. Point of view: If countries spend more money on meeting the basic needs of their citizens, they will allocate more money toward improving the educational structure. For example, students could benefit since these countries can spend more money on new technology designed to help them learn faster and more comprehensively. In addition, school districts could use the extra money to secure their schools so that there are fewer chances for school violence to occur. Verb tenses: An experience that changed me was my graduation from college, an event which helped me to become financially independent. Before I had finished college, I lived at my parents’ house rent free. In addition, they bought me a car, paid for my insurance, and even gave me gas money so that I could do my errands. However, when I completed college, I got a job as a pharmacy technician and was able to move out on my own in an apartment not too far from my parents’ house. Having that steady income helped me learn how to budget my money so that I could afford my new living expenses. Had I not graduated, I would not have been able to learn how to live independently. Verb tenses in mood and voice: If Lana has time, she will consult with her TOEFL speaking and writing specialist later on today so she can get some feedback about changes that she should make in her speaking and writing practice routine to help her score higher on the TOEFL exam. Moreover, next week she will register to take the exam if her parents agree to wire her the money she will need to register for the exam. Point of view: Unlike coal, solar energy is a viable form of energy that I can use for electricity and heat. First of all, solar power in a clean source of energy that can be used to produce electricity. In areas with abundant sun, home owners can have solar panels placed on their roofs so that these panels can produce sustainable electricity at reasonable costs. Second of all, solar panels can also be used to heat water throughout the year. Therefore, instead of having to rely on electrical companies for power that they produce from burning coal or having to get power from natural gas companies, I can use solar panels to meet my power needs in both of these areas. Verb tenses: If I have to choose between bicycling and running, I prefer running since I can burn more calories quicker and the equipment is less expensive. First of all, running helps me to burn more calories in an hour than bicycling. For example, two weeks ago, I ran for one hour, and, according to my GPS watch, I burned 735 calories. However, my friend Frank, who bicycled 60 minutes yesterday only burned 360 calories. I also prefer running since it is not nearly as expensive as bicycling. For example, running shoes, shorts, and a watch will cost $300-$500. However, a bicycle can cost between $300 and $1000’s of dollars. Therefore, I think running is a more beneficial form of exercise. Verb tenses in mood and voice: According the reading passage, advertising affects people’s behaviors politically, and in the listening passage, consumers are affected economically by advertising.